Wheat Ridge, Colorado is a thriving community of just over 30,000 people located roughly five miles to the northwest of Denver proper. 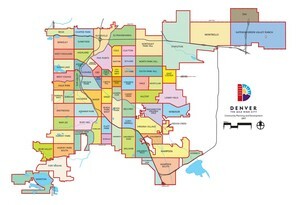 Considered a suburb of Denver, Wheat Ridge was established at roughly the same time as the capitol city and has its own unique history as well. Founded in 1859, Wheat Ridge is one of the oldest sections of greater Denver. This began as a farming community that supported the nearby mining establishments that were established in the area. For the next 100 year, Wheat Ridge continued to develop as an agricultural center and even became the largest producer of carnations in the world by the middle of the 20th century. For a town with such a long and rich history, it took 110 years for Wheat Ridge to officially incorporate, which it did on August 20th, 1969. The city itself has grown considerably into a more urban setting, but still features some hints of its past. The Baugh Cabin, which was one of the first log cabins to be built in Wheat Ridge when the town was first founded, has recently been restored. Wheat Ridge is in many ways a combination of the old and the new. Set on the western edge of Denver, the emphasis in on the outdoors as the city features over 20 parks and enjoys a wonderful view of the nearby Rocky Mountains. West Ridge retains some of its older character as a more rural farming community, but is now mixed with a very modern city life with an emphasis on retail markets, cultural events and family-owned restaurants. For those who love antiquing, Wheat Ridge is the perfect spot as the city is filled with small, unique antique stores filled with interesting and diverse items from the past. Plus, when you get hungry, there is a wide diversity of restaurants to choose from Italian to South American and more. This new emphasis on the urban luxuries however has not dulled the open spaces and attractions for those that love the outdoors. In addition to the numerous parks and recreation areas, Wheat Ridge also boasts equestrian trails, open public spaces and the vaunted Wheat Ridge Greenbelt Trail System for those who love to walk and bike. Birdwatchers will especially enjoy Prospect Park, a place where a wide variety of birds gather and mingle. Prospect Park also features an RV park and campground for those who wish to spend more time in the beautiful outdoor setting that is Wheat Ridge. With new, modern neighborhoods offset by the emphasis on outdoor activities, Wheat Ridge is one of Denver’s most unique suburbs. The selection of housing choices is wide ranging, the services are all modern and up to date, yet the feel of the city retains the historic roots from which it developed. All in all, Wheat Ridge is one of the hidden secrets of Denver that is quickly being discovered by those looking for a modern form of living with plenty of amenities, shopping opportunities and the open range that this part of the United State is known.